A recent stream of cold air from western Russia (Siberia), dubbed ‘the beast from the East’, has caused temperatures in England as low as -15°C in parts, with much of the UK in temperatures around freezing during the daytime, lower at night. Along with the icy temperatures, snow has blanketed areas across the UK. Whilst I can appreciate the difficulties caused by a sudden, unexpected change in the weather, I can’t help but become excited by the prospect of snow and embrace the possibilities for lots of science exploration. Let’s not forget that children will also naturally explore, and capturing their questions and using these as a basis for developing skills of working scientifically is a win-win situation – the children will be engaged from the outset and enjoy finding answers to their own questions; they will also be happy to be directed into other lines of enquiry. Having ideas (and simple, readily available materials at hand) makes it even easier to ensure you can link activities to the curriculum if necessary. Encourage children to design their own experiments and plan ways to capture their results and their learning (though bear in mind that phones/tablets etc. may be at risk in this weather and that batteries do not last long in low temperatures). Photos and videos, however, are great for recording the activity and the fun.Of course, if school is closed due to snow, you could provide parents with ideas to keep the children busy at home! Below are my suggestions to get you started. Each can be adapted for children of different ages and/or abilities. Encourage children to make predictions, design suitable tests and get involved in lots of opportunity for talk. Investigating Friction – perhaps one of the most obvious aspects of science for an investigation in the snow. What is the best surface on which to slide over snow (relate to skis, snowboarding, toboggan, etc.)? Think about ways of deciding/taking measurements to determine what is ‘best’. Does it matter whether snow is compacted or fluffy? Does wax/another suggested lubricant improve performance? Tip: Trays make good toboggans. How do wheels/tyres affect movement over snow (e.g. speed, distance travelled under a given force)? Again, think about ways to determine this – perhaps time movement over a given distance. Is speed the best indicator? Discuss whether it is better to move slowly and in a controlled way. Children could create their own simple vehicles to test. What type of shoes provide the most grip in snow? Tip: putting a weight in the shoe better simulates a shoe being worn. Using a forcemeter (newtonmeter) to pull the shoes provides quantitative data. Changes in state – Snow won’t be around for long; take the time to investigate factors affecting rates of melting. Under what conditions does snow melt more quickly/slowly? Tips: Consider different locations, differences in air temperature – or materials on which snow is placed (e.g. situated on plastic vs a metal surface). Try a challenge: Whose snowball/snowman will remain frozen the longest? Why was it successful? Does the size of a snowman affect how quickly it melts? Make sure the children consider differences of width and height. Why might we consider these separately? How does adding salt affect the freezing point of water/snow? Investigate whether other substances have a similar effect on melting rates for snow. How and why do icicles form? Discuss ideas, providing appropriate vocabulary as necessary. Materials – a great opportunity to encourage talk that incorporates appropriate vocabulary. Compare properties of snow to that of ‘instant snow’ polymer. Instant snow is a superabsorbent polymer (a type of plastic that holds water within the ‘mesh’ created by its long chain molecules). It comes as a powder that will absorb up to 100 times its own volume in water, fluffing up to resemble snow. Its properties, however, are very different to snow – this provides an excellent opportunity for children to discuss these properties and cement their own ideas on solids, liquids and gases and the difference between changing state and simply absorbing water. Over time, water in the instant snow will evaporate and the polymer will return to its original state. Instant snow can also be put in a freezer to add a further comparison and extend the discussion. Children (and adults) hold many misconceptions about heat flow and insulation, which is unsurprising when we often say things like, “Close the door, you’re letting the cold in!” Of course, air moves and a cold wind may blow into a house. However, heat (a form of energy) flows from regions that are hotter to those that are colder. So when we use insulation, it reduces this flow from a hotter area to a colder one. Thus insulation can keep hot objects hot (preventing heat flowing out, which would make the object colder) and a cold object cold (preventing heat flowing in to warm it up). 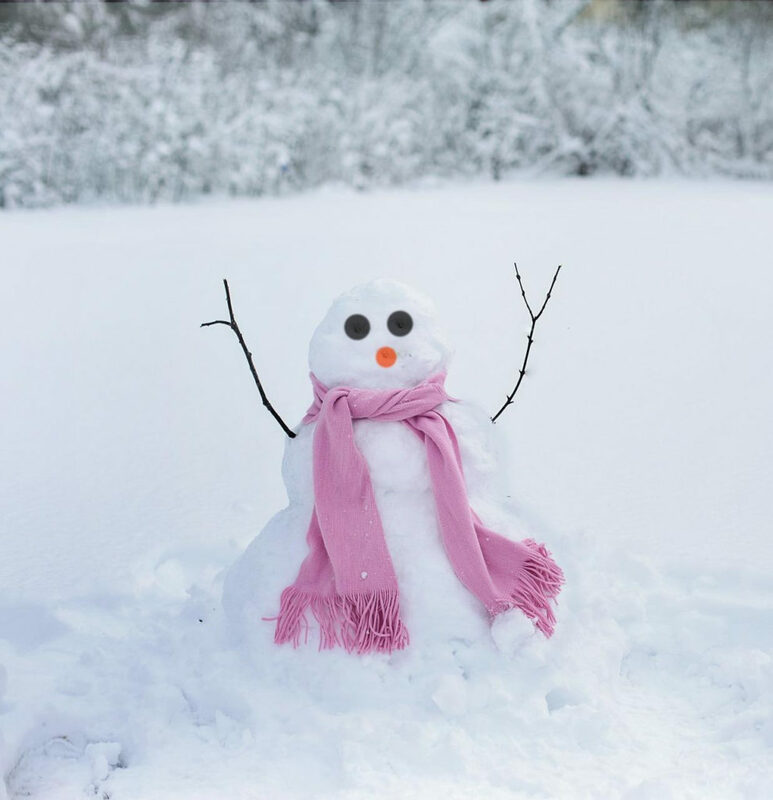 Also, children’s experience of wearing a coat is that it will ‘make them warmer’ – thus there is an expectation that a snowman wrapped in clothing will also become warmer, without the recognition that the human body will be generating the heat inside a coat. Testing the children’s ideas and discussing the outcomes of these investigations is a great way to dispel the misconceptions. Should you dress a snowman? (Does this make a difference to how quickly it melts)? How well does snow itself act as an insulator? Tip: Plastic water bottles filled with hot (not boiling) water are ideal test subjects. A hole in the cap can be drilled if you are able to provide a thermometer to measure changes in temperature. Can you build a small shelter or igloo (for a toy) from snow? Ask: What makes the structure strong? Is all snow suitable for construction? Can you test the shelter’s strength? Compare the volume of snow to volume of water produced when it melts. What volume does this water occupy when refrozen into ice? Investigate relationship between mass and volume of water (1kg water occupies 1 litre). All snowflakes are unique in terms of their structures but all have 6 sides, 6 lines of (reflection) symmetry and rotational symmetry of order 6. Snowflakes form as water vapour in the atmosphere cools and condenses directly into an ice crystal. Snowflakes are all unique because each flake takes a different path through the atmosphere as it falls, experiencing different temperatures and other atmospheric conditions (such as humidity) along that path, which affects the way the crystals form on the original ice crystal to form the flake. The children could make paper snowflakes – you will find instructions readily available on the Internet – ensure you choose a pattern for a 6-sided snowflake for scientific authenticity. Can the children find footprints to match their classmates’ shoes? Tip: have the children use wax crayons to create rubbings on paper of their classmates’ shoes, then find matches in the snow. Can the children identify any animals by footprints in the snow?